Herts Traffic Management Ltd is a provider of temporary traffic management equipment, systems and services, delivering its services on a daily basis to a wide portfolio of companies operating across industry sectors as diverse as TV, Film & Events through to Construction and Civil Engineering and incorporating the majority of utility companies and working within the electricity, gas & water industries within London & the South East of England. The company has operational locations based in Watford, Gatwick, Braintree, Winchester and Rochester. Mr David DeMore, the company’s Fleet Compliance Manager, explains what and how Herts Traffic Management have achieved whilst maintaining and improving the high standards required in the Traffic Management industry with the assistance of FORS. At Herts Traffic Management we have fully committed to the implementation of ISO 9001:2008, BS OHSAS 18001:2007 and BS EN ISO 14001:2015 standards and have attained accreditation to these standards; this commitment affirms the resolve of the senior management of Herts Traffic Management in establishing across all areas of operations, working and managing with a positive culture to all aspects of Health Safety Environment & Quality and this ethos fully incorporates the FORS standard. The saying “what gets measured gets done” is only partly true. Focused action comes about only when lines of communication are open and when the ranges of performance indicators are compatible with the equipment and innovation priorities that the individual company has chosen to follow. Continuous understanding, learning, and adjustment are necessary to make sure that the performance indicator scores encourage innovation in a direction that underpins the company’s competitive position. At Herts TM we view that the means and ethos by which we are able to consistently provide our clients with a comprehensive and professional service with competitive and sustainable market pricing, that comprises of not one single differentiator; but is rather a composite of a wide range of efficient processes encompassing the use of the latest technologies and innovations. To excel in the delivery and innovation of high-quality products, services and technical expertise and to persistently strive for excellence. To continually challenge the way things are done and look for pragmatic, innovative solutions and new ideas for improvement. We first encountered the FORS standard as a contractual requirement when bidding for a particular contract. We quickly realised that this standard would benefit us greatly when tendering for work across London area with a wide range of our major clients working within the construction and utility sector. When we looked at the requirements and the benefits of joining the scheme, we realised that these were very well suited to Herts Traffic Managements daily operations and perfectly complemented our mindset of a positive culture to all aspects of Health Safety Environment & Quality. Herts Traffic Management was pleased when they submitted and passed their initial assessment at the first attempt. This gave us the encouragement and impetus to maintain and constantly review our systems, processes, policies and company procedures. 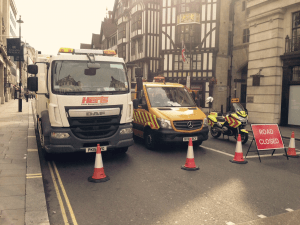 During the process Herts Traffic Management found the FORS team to be helpful, professional and realistic with the achievements that had to be met within a commercial business. On achieving accreditation to the FORS standard we further embraced this achievement by utilising the benefits that this brought to our company, in particular the performance management tool/driver and the CPC training/practitioner. We then took the decision to build on this achievement and took the next step and started the process for accreditation to the FORS Silver standard, and this was first achieved in June 2015 and has been maintained since then. A result of this achievement has been the retention of our existing client base who stipulate compliance to the FORS standard as a pre-requisite to being an approved supplier and we have accordingly increased our client base and workload with similarly minded clients, this leading to expansion of our fleet and to the employment of more staff. We also have access to a wide range of benefits and discounts provided as part of the FORS scheme such as workshops/driver licence checking etc. We have implemented and seen improvements with the safety of road users whilst Herts Traffic Management are carrying out installations in vulnerable areas. An example of this is where we recently carried out works in central London and placed extreme emphasis for cycle users above and beyond requirements to reiterate safety. I feel our drivers have seen the benefit and improved their standard of driving subsequent to completing the eLearning module. As described above having achieved the FORS Bronze accreditation we then decided that we should progress the FORS Silver standard and having achieved this we are now ultimately looking to achieve the FORS Gold standard. This will help the company to maintain its ethos of continual assessment and improvement and to maintain a high level of road safety, at the same time encouraging the drive to reduce our environmental impact and allow Herts Traffic Management to tender for specific contracts and potential new clients. Herts Traffic Management has implemented Occupational Health Screening for all employees. This delivers health surveillance and ongoing health checks that may be required for employees working in safety critical environments and or exposed to particular substances or hazards in the workplace, however Herts Traffic Management has implemented this process for all of the company’s employees. This is supports and promotes employees to maintain a healthy life style. We encourage and welcome all individuals into our traffic management workforce irrespective of ability or prior experience by promoting a full package of National Highways Sector Scheme training which is delivered in conjunction with Lantra Qualifications. We undertake a programme of continual driver assessments and additional training is provided where there is a requirement for additional resourcing of trained drivers and for continual improvement, thus offering employees a progress path within an elite industry. Herts Traffic Management has implemented a Green Fleet policy, and this has resulted in that we have three new hybrid vehicles on the fleet. We are constantly monitoring the Hybrid vehicle market for the potential vehicles that will be suitable as an alternative option to the vehicles currently in operation within our ever-growing fleet. In order to make continual fleet improvements we have also looked at getting LNG HGV vehicles, but it is not available for Safety Vehicle Impact Protection Vehicles (IPV) which are used within the traffic management sector. 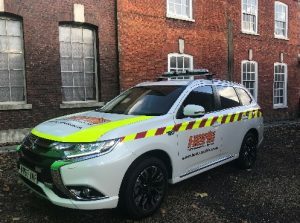 We have introduced Mitsubishi commercial PHEV vehicles in to our fleet which is proving a great success and have implemented the procedure that every driver of a company vehicle is to complete the loCity eLearning course, which is part of our green fleet policy and which has been inspired by FORS standard. Achieving and maintaining the FORS Gold standard will mean that we will be in a position to promote ourselves to our clients as a FORS fully compliant supplier and by setting the standard in our industry this will hopefully encourage all clients to demand and for all competitors to attempt to achieve the same level of compliance as Herts Traffic Management; whilst at the same time helping to make London and home counties a safer place. This hopefully shows that as a company we are prepared to invest in London by making it a safer and happier place to live and work. ‘FORS is now a fundamental part of our business, not just for the direct benefits that we can achieve as a business, but as an indicator of the standards we set and work to. Our membership of the FORS scheme is now an essential part of our tendering processes, and we encourage our suppliers to be part of FORS as a basic requirement, and as a result of this association we have applied the FORS ethos to our method statements and to our company policy’s, and these are implemented across our depot network and not just for our operations within the London area.